The great Spike Milligan has died at his home in England, aged 83, after a long illness. Flags should be torn down around the world, national leaders should be smeared in French mustard and tossed from clifftops, and everyone should immediately rush to the nearest bar and order a jug of Guinness and drink it rapido! The wearing of underpants upon ones head is mandatory! Beloved Spike, Xenox News salutes you! The obituary below was written by Spike Milligan himself in July 1990 for the Sunday Correspondent newspaper. 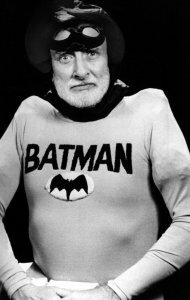 Spike Milligan was born Terence Alan Milligan on the 1 April, 1918, in a hospital in Ahmednagar, India. When he grew up he wrote the Goon Show and died. Well, I was educated first at the Convent of Jesus and Mary where I consistently passed top of the class. While I was there the nuns had 16 immaculate conceptions. To Rangoon (the Rangoon Show folks) and the Brothers de Salle - despite the earthquake of 1929, I passed all exams with honours, especially English lit. I then wrote the Goon Show and died. In 1933, I returned to England where I learnt to sing like Bing Crosby. In 1936, won silver cup crooning at Lady Florence Institute Deptford. Act of heroism - 1937, on ferry crossing to Falmouth, friend Jim Cherry fell off and was rescued by me; Falmouth Chronicle carried the story thus: CROONY CONTEST WINNER SAVES FALLING CHERRY. Wrote Goon Show and died. Then I learnt the trumpet. Won Melody Maker contest silver medal at Lewisham Town Hall, presented by Benny Carter. Benny Carter was my hero; after the operation he became my heroine. Now I was 19, held together by pimples, Brylcreem and Durex. My first sexual encounters of a thud kind - I fell off. She lost hers, I lost mine, snap! Wrote Goon Show and died. Then came the war: North Africa, promoted in the field (they wouldn't let me indoors). Mentioned in dispatches: nothing positive, just mentioned. Heard playing with Army jazz band by L/13 Div K Carter (later producer of the Benny Hill Show), put in concert party. Invasion of Italy - blown up at Monte Cassino - came down again unaided. Demoted as "unstable", spotted by gay colonel: was his chauffeur. He said if he could hold mine he'd promote me; after one stripe he found one bigger who soon became sergeant. I and my trumpet were posted; breaking out of the parcel found I was in the Central Pool of Artists, Naples - a depot of bomb-happy squaddies. Wrote Goon Show and died. Secombe there. He's seen Naples but didn't die; there was too much him. He was doing an act of shaving and singing - yes, shaving and singing. He knew what he was doing - there was no Shaving and Singing Regiment in the country. The Bill Hall Trip who, well, I was a good rhythm guitarist like Django's brother. Seated one day at the guitar, I was weary and ill at ease. And fingers wandered idly over the ivory keys ... (bang, there goes another elephant). I was joined by a jazz violinist, then a jazz bassist; we became the hit of the Central Mediterranean Forces, nabbed by Gracie to appear on VE night concert, Argentine Theatre, Rome - we are the hit of the show; we escape, before she can sing Sing As We Go. Wrote Goon Show and died. The war ends, we seek fame in the UK - failure. I go solo; that is, I'm out of work on my own, meet up again with Secombe, then Bentine, then Sellers, then ... Dorita Trent! Forget the others, no, I must write a show for them, yes. Between doing Dorita, I wrote the Goon Show and died. I had long been aware of the state of the environment, so with Jean Scott formed the Finchley Society, saved building from a witless Finchley council. TV had arrived, Sellers asked me to do a script for TV. I wrote A Show Called Fred, the very first Producers and Directors Award. Divorced, for doing it to Dorita, now I went into oblivion. I marched with Bertrand Russell on the anti-nuclear 100 Committee (looks like we're winning), I joined all environmental groups; whenever I got the chance, I preached the disaster of over-population. Wrote Goon Show and died. No work in England; Australia - radio and TV; out there saved an unrecorded Aborigine cave, carvings and paintings of the extinct Dharug tribe. I found and saved the convict-cut stone cottage of major early Australian poet Henry Kendall (now a museum). I could have gone on, stopped there and waited for the knighthood, but no. Instead, they relieved me of my British passport and I was obliged to become Irish with the title of Mister. Writing poetry for my children, eldest Laura said: "Why don't you make a book, Daddy?" I did. Success. Wrote Goon Show and died. Feel I have shaken off the working class curse. Feel good! Supporting the salvage of SS Great Britain and HMS Warrior. Saved old gas lamps of Constitution Hill. Started two-year restoration of Elfin Oak, Kensington Gardens. I yearn for a good film part, Bernard Miles renews my flagging spirits by giving me role as Ben Gunn in Treasure Island. Success, but nothing comes of it. I write Puckoon, bestseller. I then wrote the Goon Show and died. Under direction of idiots at MGM I make three "comedy" films. I had no say in the writing or direction and it showed. Back to Oz to do a second radio series. Got a telegram from Sellers saying short film I wrote and directed, Running, Jumping and Standing Still, has won awards! I'm cast in a boring Russian drama, Oblomov. First night disaster. I ad lib the play to success. It breaks all box-office records for the Comedy Theatre; everybody comes - Olivier, Barbra Streisand, the Royal Family. Finally BBC2 allows me to do a series of TV shows I call Q. The style was pounced on by all the up-and-coming comics, Python among them. Clubs: Ronnie Scott's. Hobbies: writing Goon Shows and dying." Needless to say, the world needs Spike now more than ever.